I absolutely love peaches and I firmly believe that the only way to eat them is fresh, standing over the sink, with the juice dripping off your elbows. 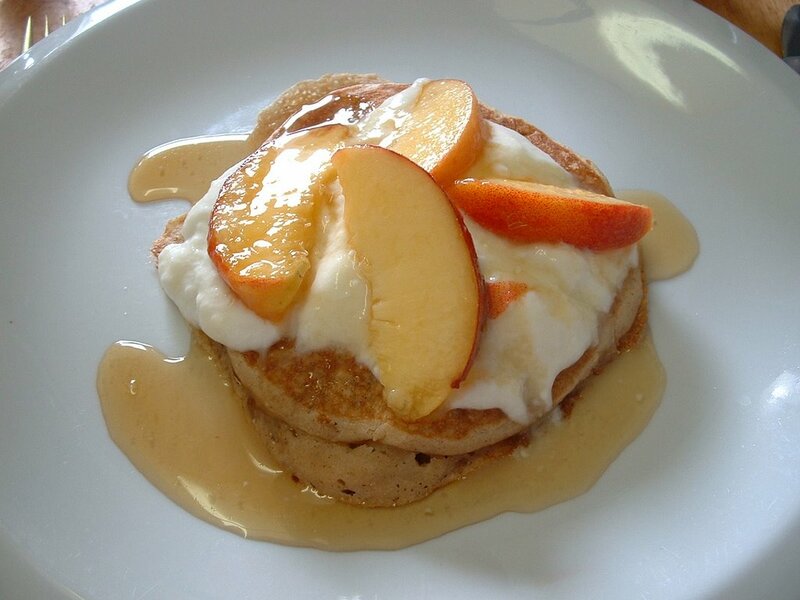 And while I often can’t resist their charms long enough to turn them into anything else, I do take the time on late summer mornings to make pancakes with peaches and yogurt for breakfast. I usually slice the fruit and stir them up with a little sugar and some lemon juice before I start the pancake batter. That gives them a chance to release their juices, making them even more sumptuous. When the pancakes are ready, pile on the peaches, a dollop of plain yogurt, a drizzle of maple syrup, and you’ve got sunshine on a plate. It’s probably a good thing that I can only have this for about 3 weeks of every year (oh, and believe me, I do).